There are several access points to Pretty River Valley Park. We took Grey 33 to Pretty River Valley Road and parked in the “Snodrifters” lot. We walked southwest for a few hundred metres, past two sharp turns on the road to the tinier parking lot. The start of the Bruce Trail is marked by white blazes. After a short hike, we took the blue-blazed Pretty River Side Trail towards Sundown Lake and came across a small stream that we had to cross. The side trail is shorter and more scenic compared to the main Bruce Trail. Once the side trail rejoined the Bruce Trail, there was some elevation gain as we were at the highest point of the Bruce Trail! We encountered quite a few mountain bikers that day, so be on the lookout for them, but they were all very courteous. 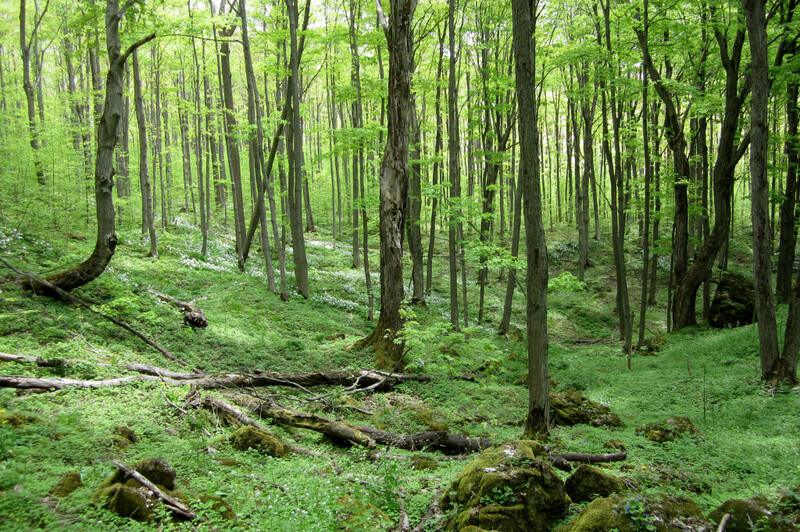 The Bruce Trail turned right and continued through a forested peak, which was lit by the sun and it was so green and bright! It felt like we had stumbled upon Elven fields that expanded all around us. We finally approached Osler Bluff, which was a great rest stop. 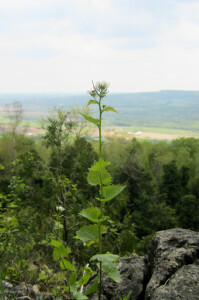 The view of the valley below us and Nottawasaga Bay in the far distance was a wonderful reward. There was an abundance of turkey vultures, as we were told by two seasoned hikers that were on a mission to complete the entire 900km of the Bruce Trail over a series of many weekends. Wow! On our descent, we had to retrace our steps back to the starting point. There were other side trails leading to the north side of the park. It would’ve been nice to take a different route down, but we were parked on the south side, so that was the end of our hiking adventure for the day. The park entrance is off Hwy 21, south of Grand Bend. Once inside the park, we took the fork to the left and parked in the large lot where the store and restaurant are located. The staff cooked us some delicious burgers and fries, not exactly the healthiest meal to start off a hike, but we wanted to re-energize after the long drive. The start of the Cedar Trail was a short walk away, just across the bridge where we saw families enjoying the great outdoors on canoes and paddle boats. 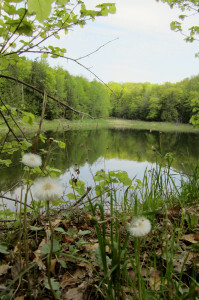 As described on the map of The Pinery, the hike is an interpretive walking trail. So it is not really a hike, but a relaxing walk through the oak savanna. 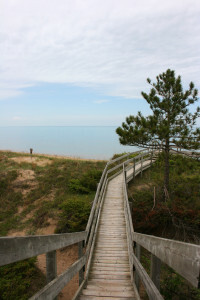 We took the extension trail to Lake Huron, along well-maintained stairways and a boardwalk above the sand dunes. The trail led directly to the beach. 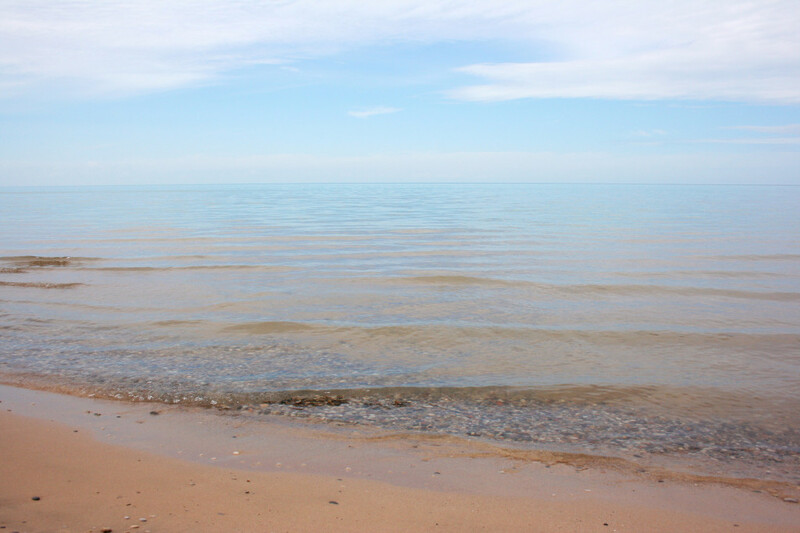 The day that I was there, Lake Huron was so clear and still that it looked like the sky was reflecting on glass. Standing on the shoreline and seeing the lake extend infinitely was definitely the highlight of the walk. Eventually we had to go, so we took the extension trail back, and continued on the loop to the starting point. 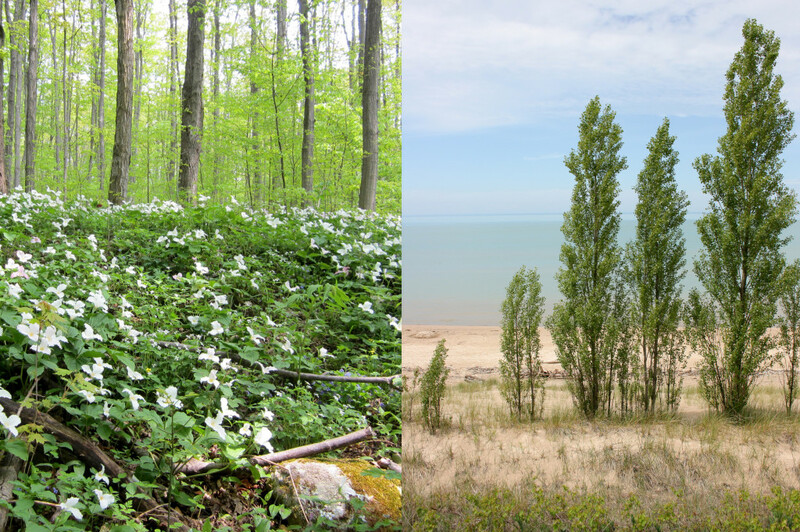 There was a viewpoint of the Old Ausable Channel, which on any given day would have been nice, but we were already spoiled by the great serenity of the Great Lakes.